It is well known that, due to the inherently low efficiency of the X-ray generation physical process, operating an x-ray equipment involves sending significant amounts of electrical energy to the X-ray generating element, the X-ray tube. While a small fraction of this energy is converted to X-rays, the remaining turns into heat that must be removed from the unit to allow further operation without any undue overheating. In conventional X-ray tubes, including mammography tubes, the tube insert, containing the anode, is enclosed in a metal container, the tube housing, lined with a shielding material and filled with insulating oil. 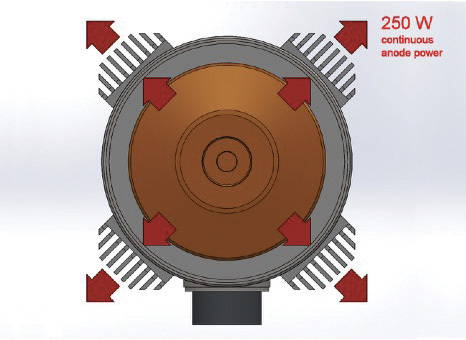 Heat radiated by the anode is transferred to the oil and the housing vessel, and from these is further transferred to the ambient air, often by natural convection, with a low heat dissipation capability. It can be seen that with this structure the tube housing, after a temporary heat storage of a few exams, acts rather as a barrier against an effective removal of the energy from the tube unit. In this unconventional x-ray tube, of metal – ceramic construction, the tube housing and oil are absent, let alone a small lightweight box containing the radiation shielding and electrical accessories. The energy associated with each exam is rapidly transferred directly to the ambient air by forced ventilation, without the need of being accumulated temporarily in an intermediate body. 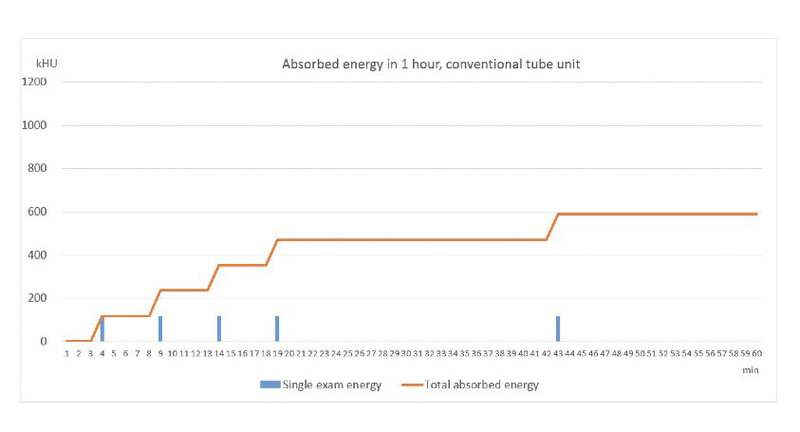 The energy transfer rate is more than three times higher than the equivalent parameter of a conventional tube unit, so the number of exams that can be performed in an hour, or in a day, is as much higher. 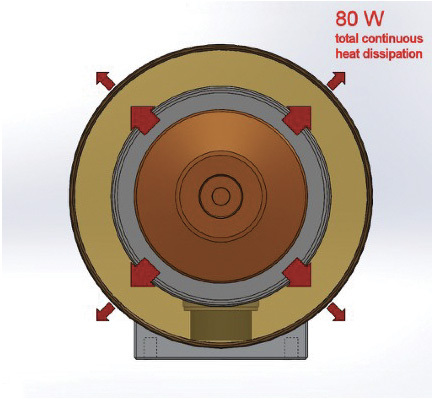 Usually much attention is given to the tube unit so called heat capacity, more exactly the maximum tube unit heat content, because, due to the limited capability of heat dissipation of the conventional tube housings, tubes are operated so that the generated energy is gradually stored, exam after exam, within the housing, then waiting for a long delay until the accumulated energy is slowly released to the ambient air. 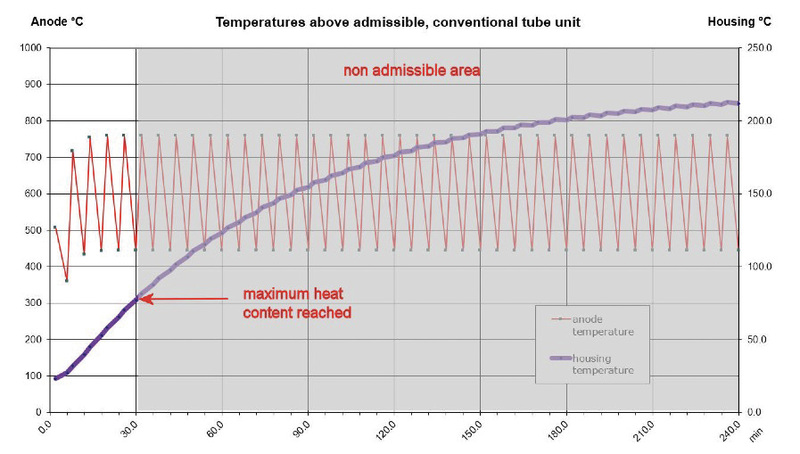 Alternatively, rather than waiting for a long cooling time, the number of patients per hour is so programmed that the average energy input due to the succeding exams matches the low energy dissipation capability of the tube housing. 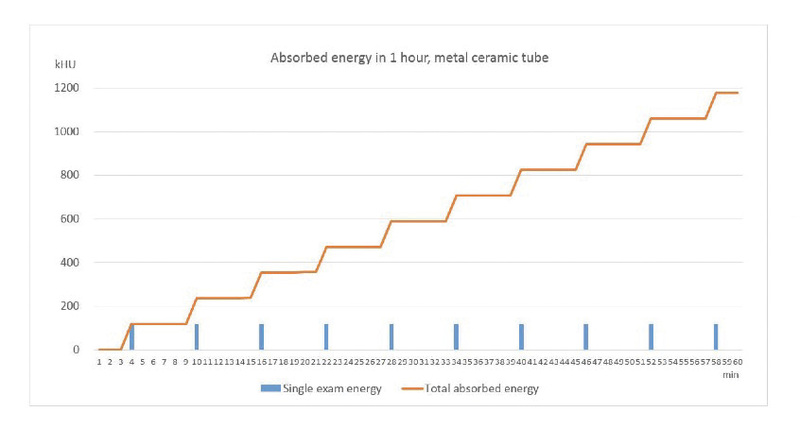 The diagram below shows how the anode temperatures cycles for each exam, and how the exams cadence must be slowed down after a few exams, when the maximum housing energy storage is reached. Exams are assumed to be composed of four tomosyntesis scans, 30 kV, 140 mA, 400 ms pulses, 1 pulse per second, 13 pulses per scan, 1 scan every 30 seconds. 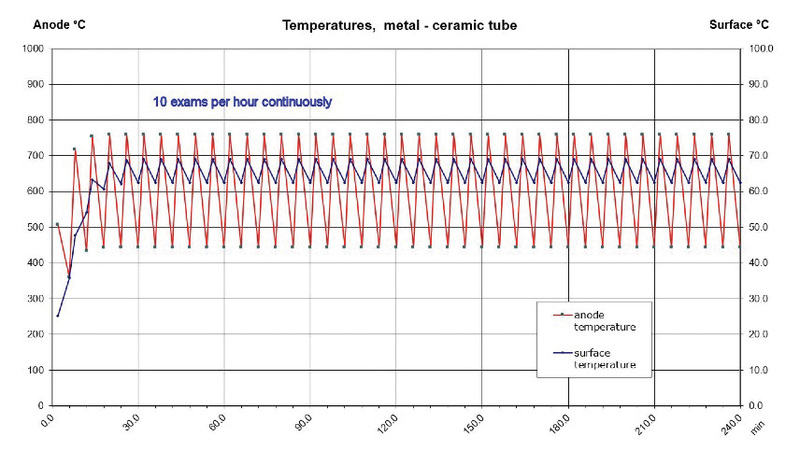 The following is the equivalent diagram for a metal – ceramic forced air cooled tube, where the same cadence of 10 exams per hour can be kept continuously, because energy is dissipated continuously with no need of energy storage. These two final diagrams show how equipment evaluation should address to the total energy that could be input in the system in a given time interval rather than to the fraction of this energy that can be stored, because the total energy is the parameter that governs the number of exams that can be performed in this same time interval. A final feature of the unit to be taken into consideration is it low weight, which is half than a conventional unit. It allows a lighter supporting structure, lower inertia during movements, better image quality due to lower vibration when stopping movements. 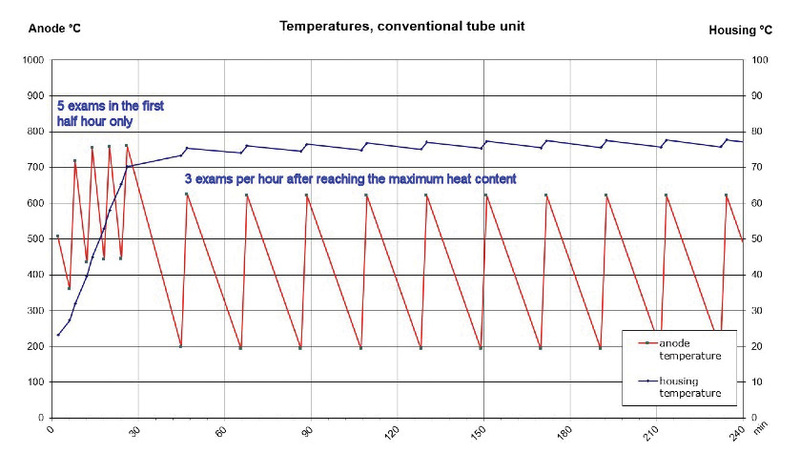 This diagram shows that exceeding the number of exams per hour that is allowed by energy dissipation property of the tube unit leads to intolerably high temperatures in the tube unit.